The London premiere of Ewan McGregor and Naomi Watts' new film, The Impossible, will benefit a charity set up to help victims of the devastating 2004 Asian Tsunami. Indian Ocean Disaster Relief works to alleviate the suffering of communities in the Indian Ocean region, through the provision of sustainable education and training programs that improve the capacity of local organizations and enhance the livelihoods of vulnerable children and young people. 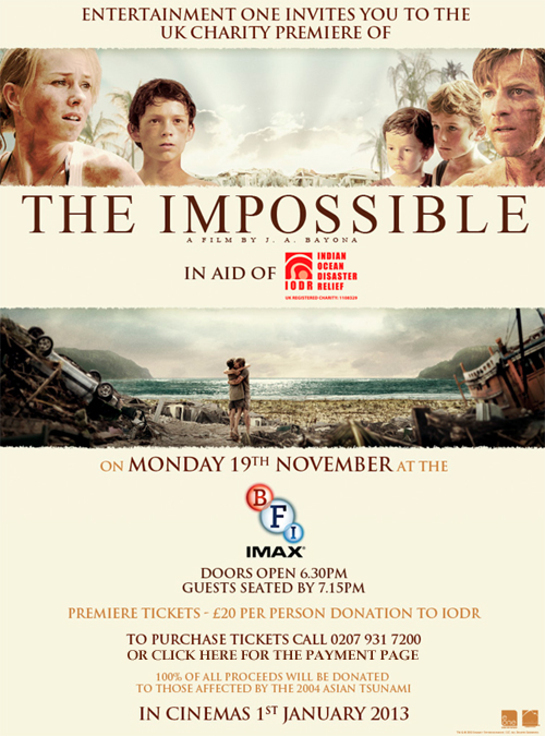 The Impossible tells the story of a family affected by the disaster, and the premiere – which will be attended by the stars and director of the movie – will take place at the BFI Imax Cinema in London on November 19. Tickets to the premiere cost £20, and more information can be found here.